Did you know that you can make money in your free time? That’s right, you can use many of the best paid survey sites to make money and monetize your spare time. The best online survey sites pay you for your opinion, or even to test out a new product. While some survey companies look for a specific type of individual, most of the legitimate paid survey sites take individuals from a variety of backgrounds. Unlike other side hustles, you don’t really need any special skills or expertise to make money from the best survey sites. All you need is a computer, Internet connection, and your personal opinion. In fact, many of the top paid survey sites let you complete surveys from your smartphone so you can do them whenever you like. One thing to keep in mind with many survey sites is that you have a variety of ways to redeem points. Cash is always an option, but most of the best paid online survey sites also let you redeem points for free gift cards from a variety of retailers, including Amazon, Target, Walmart, and more. You get to select which redemption option you prefer and can change at any point. Do you want to make money in your spare time with little work? 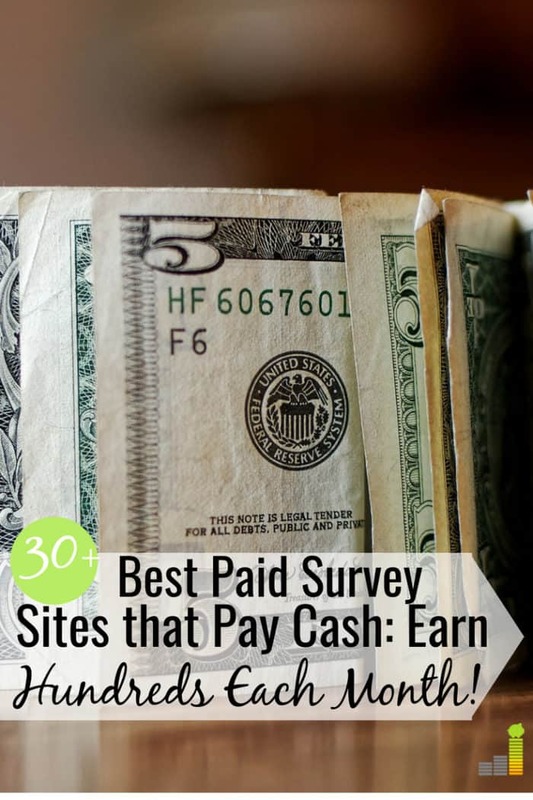 Here are the 31 best paid survey sites to make money and put a little extra cash in your budget. Survey Junkie is one of the best survey sites to make money because it’s so simple to use. The Survey Junkie platform is one of the oldest survey sites in the space, starting in 2005 and boasts over three million members. It’s pretty easy to start earning money with Survey Junkie. When you open an account and fill out a quick profile, you can start taking surveys. You can start redeeming points once you hit the 1,000 point mark, which is equivalent to $10. You can redeem cash via PayPal, or you can get e-gift cards, whichever you prefer. Pinecone Research is one of the highest paid survey sites in the market. They pay $3 per completed survey, and they also pay $3 when you first sign up. Pinecone Research is a little more picky in their selection process. You can only start an account by clicking the above link and not through their public site. Pinecone specializes in product testing over straight surveys as they want to test products before they make it to the public. Like other survey sites, you can redeem points for cash or e-gift cards and every 100 points equals $1. Our favorite part of Pinecone Research is that they have no minimum redemption amount, so you can start redeeming after your first completed survey. Is Pinecone Research legit? Check out our review to learn how the platform works and to maximize earnings. Another great part of InboxDollarsis that you don’t have to do any point to cash conversions. InboxDollars pays cash (you can also redeem cash for e-gift cards) so you know exactly what you’re going to receive. Each task is worth a different amount so you won’t always earn at the same frequency. The one downside to InboxDollars is that they have a minimum redemption amount of $30. They offset this by paying a $5 signup bonus to help you start earning right away. InboxDollars offers so many ways to earn money that it’s easy to rack up rewards. Read our InboxDollars review to learn how to earn more on the platform. Vindale Research is similar to InboxDollars in that they don’t mess around with points. They pay out in cash, so you know exactly what you’re going to earn with each survey you complete. You can also make money in a variety of ways, from using their search engine, to reading sponsored emails. Vindale Research surveys for a number of niches (as do many survey sites), including cars, fashion, and restaurants. You simply open an account, fill out a quick profile, and you can start filling out surveys that match your demographics right away. Vindale Research has a higher than average minimum redemption amount of $50. However, Vindale Research is one of the higher paid survey sites so you can hit that redemption amount fairly quickly. They also pay a $2 signup bonus to get you started. You can earn money with PrizeRebel by taking surveys as well as signing up for free trials and liking their social media platforms. It’s super simple to signup for PrizeRebel. They claim you can have your account open within ten seconds and you can start taking surveys from there. PrizeRebel has a minimum redemption of $5, and every 100 points equals $1. If you buy many items from the Google Play store, PrizeRebel is a great option to earn free Google Play credits to save money. Panda Research is like many of the other survey sites mentioned. You can make money by taking surveys, but you can also earn by referring friends, reading emails, and more. Panda Research is one of the highest paid survey sites in the space, offering some surveys at up to $25. Payouts vary, of course, but it’s great to know they have surveys that pay. The minimum payout is $50 and they pay out twice a month – on the 1st and 15th of each month. Panda Research also pays out a $3 signup bonus after you open an account, fill out a profile, and verify your email. Swagbucks is one of the most popular paid survey sites in the space, having paid out nearly $200 million in rewards. You can also get paid to watch movies on Swagbucks so there are plenty of opportunities to make money. When you complete tasks, you earn SB points that can be redeemed for cash or e-gift cards from hundreds of different retailers. The minimum redemption for cash is $25, but you can often redeem gift cards for as low as $1. Swagbucks regularly puts gift cards on sale so you can redeem them for fewer points. Swagbucks offers many ways to earn money on the side and is one of the best legitimate paid survey sites you can use. VIP Voice is one of the oldest online survey sites in the space. Its parent company started in 1967 and they do more than 12 million surveys each year. As with other survey sites, sign up is fairly simple. You open an account, fill out a short survey, and you’re able to start taking surveys that match with your demographics. You earn points when you complete surveys with VIP Voice. The one downside to VIP Voice is that they do not have a direct paid system like many other of the best paid survey sites. Instead, your points are entered into drawings for cash, appliances, electronics, and vacation packages. On the flip side, VIP Voice claims to give away thousands of rewards each month. you can complete their surveys relatively quickly and they offer regular drawings for cash, including a $5,000 scholarship for students. Opinion Outpost is another well-known online survey site. One of our favorite features of Opinion Outpost is they offer seven different payment options, from cash to physical gift card so there’s plenty of options to choose from. Opinion Outpost has a relatively low minimum redemption amount of just $10, but you can redeem gift cards starting at $5. As with other paid survey sites, completely fill out your profile information when opening an account to ensure you get more opportunities. The best part of Opinion Outpost is they’re one of the fastest in the space to process payments. When you request funds, they’re moved instantly to your PayPal account. Their $10,000 quarterly reward drawing isn’t too bad either. The Harris Poll is one of the most well-known online survey sites in the space. The platform has been around for over 50 years and is best known for their political polling. However, they also conduct surveys for a wide variety of other topics. The Harris Poll pays you to take surveys and gives you opportunities to join focus groups to increase your earnings. You can redeem points for cash or any number of gift cards. Our favorite part of the Harris Poll is that you can earn points even if you don’t qualify for a survey, which is something many survey sites don’t offer. Do you like to watch TV? Then, E-Poll could be one of the best paid survey sites for you. E-Poll is one of the easiest survey sites to sign up for. You fill out the simple sign-up form, click the activation link they send you via email, complete a short sign-up survey and you’re good to go. That first survey nets you 100 points. E-Poll specializes in surveys based on television shows. E-Poll runs a points based system, so you get points for each survey you complete. You can start redeeming once you hit the $5 threshold, which is equal to 3,750 points. Most E-Poll surveys pay out between 500 and 1,000 points so you can hit that minimum relatively quickly. They also run a $250 monthly sweepstakes for users. Like some other of the best online survey sites on our list, the more surveys you take with E-Poll, the more points you earn. The best way to earn more money with E-Poll is when you get invited to review shows the day after they air. These reviews are longer than their typical surveys but they also pay more. EarningStation is like Swagbucks and Panda Research; you can earn money in a variety of ways. Not only can you earn money by taking surveys, but you can also earn money by watching videos, playing games, and even purchasing certain Groupon offers. EarningStation is a bit unique in that they offer you an incentive bonus if you earn points for ten days in a row. Additionally, EarningStation only offers payment via physical gift cards and not cash. This isn’t a deal breaker as many of the highest paid survey sites do the same. Global Test Market is one of the biggest paid survey sites in the market, having over five million members and spanning 100 countries. Like other survey companies, Global Test Market is simple to join. You open an account and fill out a brief profile and that matches you with the appropriate surveys. Global Test Market lets you make money answering surveys on a number of topics, from eating out to cars to shopping and more. Additionally, many of the surveys let you enroll in either weekly or monthly cash drawings. Many of the surveys pay between 10 and 100 points. The minimum redemption amount with Global Test Market is 1,100 points, which is equal to $50. One feature of Global Test Market is that you can donate earnings to a variety of charities. In addition to the ways to make money, InboxPays also has a coupon section where you can select coupons to save money at the store. You can earn up to $50 per survey with InboxPays, though those are limited. You can start redeeming cash or gift cards once you hit a $50 balance. InboxPays also pays twice a month, on the 1st and 15th of each month. Springboard America is a newer paid survey site, starting in 2009. Our favorite part of Springboard America is that you get entered into a $1,000 drawing just for opening an account. Springboard America is a points-based survey system where every 100 points equals $1. Most surveys range between 50 and 500 points. They do have a higher minimum redemption amount of $50, which you can get in cash or gift card to a variety of different retailers. You’ve likely heard of the parent company of Nielsen Computer and Mobile Panel before as they handle the well-known Nielsen’s Ratings for TV programming. They’ve been around for over 90 years and collect data on television viewing habits. Nielsen Computer and Mobile Panel, formerly known as Digital Voice, compensates you to monitor your web habits. They use this information similar to how they do for TV viewing habits, and are a legitimate service. You don’t surf the web any differently than you normally would, it just works in the background. Nielsen will also send you surveys to complete on an irregular basis. Both the surveys and surfing earn you points that enter you into their weekly $1,000 drawings and monthly $10,000 drawings. Nielsen claims to pay out over 400 monthly drawings so the loss of earning smaller amounts is worth the risk. Ipsos i-Say is one of the oldest online survey sites in the market. The company started in 1975 and specializes in political-based surveys, but they offer plenty of other surveys as well – including many of the same ones you’ll see with other sites. What we love about Ipsos i-Say is their low minimum redemption amount. You can start redeeming rewards once you hit 500 points, which equals $5. You can redeem points for cash or for e-gift cards that they deliver instantly. i-Say also pays loyalty points for each survey you complete as well as get entered into drawings they offer for bonus points or other awards. MySurvey is one of the most popular online survey sites. Their parent company has been around since 1946 and they do surveys for a wide variety of companies, including being used by The Wall Street Journal. MySurvey uses a points-based system, which you then convert into cash that you have sent to PayPal, or to purchase e-gift cards. MySurvey also has a relatively low minimum redemption amount of just $10. One highlight for MySurvey is they quickly inform you if you do not qualify to complete a survey. This helps you save time and allows you to focus on surveys you qualify for so you don’t have to wait around to earn money. YouGov is one of the more unique online paid survey sites on our list. The primary purpose behind YouGov is to provide individuals an opportunity to sound off about their views on politics, spending habits, what television shows they watch, and what retail brands they use. In some instances you might even be featured in the news for your opinion. YouGov uses this information to provide statistics they publish daily on their site with the goal of helping companies and institutions better understand how to support individuals. YouGov doesn’t only focus on current events. They also pay you to take surveys and pay out a bonus of 2,000 points when you become a user. You can convert points for cash or gift cards, with many gift cards available at the $5 redemption mark. MindsPay not only pays you to complete surveys, but they also pay you to test and evaluate products. It’s simple to open an account with MindsPay and you can start completing surveys once you complete your profile information. MindsPay claims to have surveys that pay up to $50, though they do have a minimum redemption amount of $25. You also get a $3 bonus when you open an account with MindsPay so you can start earning right away. Survey Club contacts you when local opportunities are available. Survey Club is also one of the biggest online survey sites, boasting more than 16 million users. The minimum redemption level is $20, which you can get as cash or e-gift cards. Survey Club even guarantees you’ll make at least $5 in the first five minutes using the site. Product Report Card is one of the best paid survey sites as they pay you more the more surveys you take. Some sites claim they do this, but with Product Report they do pay you more as you go along. In fact, they pay you up to $8 just to complete your profile – which is nice since their minimum redemption amount starts at just $25. Not only can you make money taking surveys for Product Report Card but you can also earn money by giving short reviews of products you use around the house, as well as joining focus groups. Product Report Card works with brands like Microsoft and Gillet so you know they’re a legitimate paid survey site. OneOpinion may not have the name recognition that Swagbucks and others have, but it’s one of the most popular online paid survey sites in the space. This is helped largely by their great customer service and ease of redeeming funds. OneOpinion lets you make money taking surveys and testing products. OneOpinion operates on a points-based system and the minimum redemption amount is 25,000 points, which equals $25 in cash or gift cards. Most of the surveys with OneOpinion pay 1,000 to 5,000 points so you can start earning relatively quickly. If you qualify for product testing, you can earn even more points. Additionally, if you don’t qualify for a survey, OneOpinion pays you 50 points. We love sites like these as it increases earning potential. MyPoints has been around since 1996 and is simple to start using once you open an account. You can redeem points for cash or gift cards. The minimum redemption amount is $5 for gift cards and $25 if you want cash sent to your PayPal account. Opinion City is a newer online survey site. Like the name suggests, you give your opinion by taking surveys on a variety of different brands, from Best Buy to McDonald’s. Signing up for Opinion City is as simple as other survey sites. You fill out your profile information and, once complete, you start taking surveys. 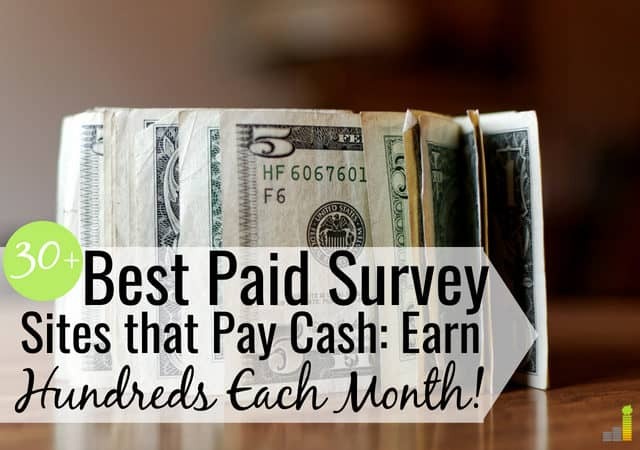 Panel Payday is one of the more unique opportunities on our list of best survey sites for money. You don’t directly take surveys with Panel Payday; rather, they connect you with survey opportunities from other companies. The higher paying opportunities aren’t as plentiful, but they’re higher than what you’ll see with other paid survey sites. Thanks to the higher payouts you’ll also see fewer surveys on a whole. Many survey sites will provide you with at least one opportunity per week, if not more. Panel Payday is closer to once every two weeks, up to four times per month. Survey Voices is one of the more unique survey sites on our list. You don’t take your surveys with Survey Voices, rather they direct you to legitimate paid survey sites and you complete surveys with them. Survey Voices claims you can make up to $300 per day taking their surveys. We’re hard pressed to believe that claim. That aside, they do direct you to legit sites so they can be a good way to add a little extra cash to your wallet. How would you like to make money from your normal shopping on Amazon? That’s how ShopTracker works. After you open an account with ShopTracker, you login to your Amazon account, which will sync the two accounts. ShopTracker pays $3 per month, or $36 per year for you completing a two-minute survey each month. It’s admittedly not a lot of money, but it does pay you for something you’re already doing so why not take advantage of a small win? ShopTracker is run by the Harris Poll, a well-known marketing research company that has been business for nearly 50 years. They’re looking for information that will help companies with their sales and distribution. Once you complete the monthly survey, ShopTracker sends you a $3 Visa gift code you can use anywhere you shop online. Ebates is one of the more well-known survey sites on our list. The site is a lot like Swagbucks and offers many ways to earn cash besides the typical surveys. You can make money using their shopping portal, which is their most popular feature. Ebates works pretty simply. You use their shopping portal to make a purchase and they give you cash back for that purchase. Amounts vary by store and product you purchase. You can even stack coupons with other coupons, or use a cash back credit card to increase earnings. Ebates pays out a $5 bonus when you open an account and you can start redeeming for gift cards at $25. Check out our Ebates review for a more in-depth analysis of their service. National Consumer Panel isn’t your typical online survey company. Instead of standard surveys, they’re looking for insight on shopping trends. When you open an account with National Consumer Panel you use their smartphone-based app to scan items you buy at the store. If you don’t have a smartphone, they will send you a handheld scanner to use at the store. The information you scan gets sent to NCP. You earn points for each barcode you scan for NCP. These points can be redeemed for cash or gift cards. NCP may also ask you to fill out a brief survey on your shopping experience, but may not be a requirement with each shopping experience. NCP also offers monthly, quarterly, and annual sweepstakes to get rewards of up to $20,000. If you want to make a little extra money doing something you’re already doing, NCP is a good option. MobileXpression is a little different; they work with companies to discover how we use our mobile devices. As a result, you can only use this online survey site with a smartphone or an iPad-like (tablet) device. MobileXpression is free to use and they make it simple to open an account. Once you open an account and download their software you start earning rewards that can be redeemed for cash or gift cards. They also hold weekly drawings for devices like Kindles or iPads. The basic premise with paid online surveys is that companies want to get feedback on their products. This tells them what consumers think of their products and provides them with information on how to improve their products. This is where a market research company comes into play. They work with companies to ask consumers what they think. This can come in the form of surveys or focus groups. How much can I make taking surveys? You will not get rich taking surveys. Some survey sites will claim you can make $500+ each week taking surveys. Maybe some people can, but it’s difficult at best and not worth the time or effort. Yes, taking surveys can be a great way to make money in your free time such as when you’re eating lunch, waiting in the doctor’s office, or watching TV. Taking surveys will not replace your day job. However, if you need to get money today surveys can be a good way to earn a little extra cash. Each survey site pays a little differently. You want to understand how they pay, and when they pay, before you get started. Some survey sites do everything electronically while others handle payment with physical checks and gift cards. Taking surveys is a great way to get free Amazon gift cards, not to mention gift cards from other retailers. You may even find more value in redeeming points for gift cards than getting cash. Make sure to read the terms and conditions of each survey site before you start. Should I pay to join an online survey site? No! You should never pay to join a survey site. The legitimate paid survey sites in the space are all free and are compensated by the companies they represent. If a survey site asks you to pay anything to join that should be a sign that you need to look elsewhere. Why do I have to qualify to take a survey? This is a common and understandable complaint of some who take surveys. There’s nothing worse to spend more than a minute or two filling out a form to then find out you don’t qualify. That’s why a paid survey site like OneOpinion stands out for giving you points when you don’t qualify for a survey. In short, survey sites need to ensure you match the demographic background for a given survey. If you don’t, it’s a waste of their time and money. They want information on their target market, which is why it’s so important you complete your profile information when you open an account. Are all online survey sites the same? No! Each survey site is different, so you want to make sure you know how they operate before moving forward. The best survey sites to make money make clear how they work, how they pay, and what to expect. Shady survey sites will hide that information, which should be a red flag. What personal information should I give to a survey site? Survey sites need to ensure you’re in their target market. It makes sense for them to ask for things like your name, age, career, number of children, income level and so forth. However, you shouldn’t really provide more information than that. If the profile begins asking for credit card information, bank information, or your Social Security number then you should go elsewhere. Taking surveys can be a fun and flexible way to earn extra money, which can come in handy around the holidays, birthdays, or even if you’d like to use the money to pay a small bill each month. They won’t make you rich but they can be a great way to monetize your free time. Have you ever tried taking surveys before to earn extra money and gift cards? What are some of the best paid surveys sites that have worked for you? What are some of your favorite ways to make extra money in your spare time? I used to take online surveys and still take them occasionally while I’m taking public transportation. I wouldn’t take them in my free time otherwise anymore because I have more lucrative side hustles. But it’s definitely a good place to start. Nice list! My wife was testing out some of the survey sites recently and got locked into a LONG survey one night. She wasn’t amused! But hey money is money. Interesting you mention that. My husband is taking surveys too. He recently signed up for a few sites and he’e just trying to see which ones work best. I haven’t heard anything about super long surveys yet (thankfully). I hadn’t heard of one opinion or earning station. I guess I better head over to check them out. Thanks for this!